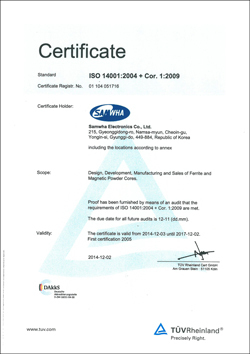 Samwha Electronics has been certified the ISO 14001 in 2005 and ISO/TS 16949 in 2003. This led to accomplishment of process-focused, performance-oriented system by combining Quality Management System, Environ-ment Management System, Six Sigma Management Innovation and ERP System. This will enhance Samwha Electronics maket competitiveness by quality improvement, customer satisfaction, and corporate credibility. ISO/TS(Technical Specification) 16949 is internationl standard of the automotive industry, which was jointly developed by IATF members and their trade associations. 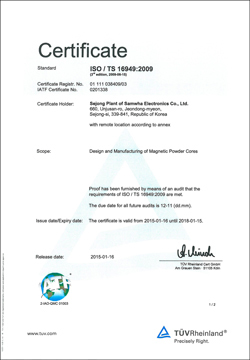 The document includes a common automotive quality system requirement. ISO 14001 is desigined to minimize harmful effect on the environment caused by activities. The system consists of a series of processes established environment policies and goals, done activities to achieve, monitor and review.